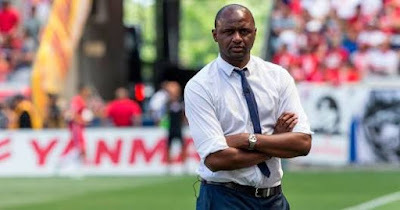 Patrick Vieira stepped down as coach of MLS club New York City FC on Sunday ahead of his appointment as the new manager of Ligue 1's Nice. In an unusual move, the news was first announced not by either club but on the website of Manchester City, which is in the same ownership group as NYCFC. Man City later unpublished the page with the announcement. Reports in France last week said Vieira had agreed to a three-year contract, and Vieira confirmed his departure on Sunday night. "I would like to thank City Football Group and New York City FC for the opportunity to have coached this tremendous football club," he said in a statement on Man City's website. "Leaving New York is an incredibly difficult decision for me and for my family and one that has not been taken lightly. This is one of the most incredible blogs Ive read in a very long time. The amount of information in this blog is about live news and this is what i am searching ! !